In your adventuring, you've decided to take up Sword-Fighting (as one does) to help defend yourself against threats - and dragons. Who will teach you this noble art? Zuko can bend FIRE. He literally had NO reason to learn to fight with swords. But he did. He learned to fight with dual swords! More than that though, he became a sword-master. He's a BAMF and I cannot imagine anyone better suited and teaching me how to handle swords. As a light Necromancer, Sabriel might not be an obvious choice, but I always loved how she still wielded a sword with such skill. And a girl with a sword is a winner in my book. 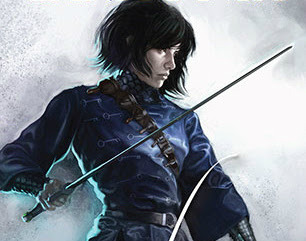 Sabriel is an all-time favorite heroine of mine now so having her as a mentor is THE dream. Aragorn is totally one of my heroes! Beyond being fierce, loyal and kind, he reforged THE blade and wielded it like a pro. He is truly epic and having him teach me the sword would be all kinds of amazing! You can't think of a sword and NOT think of this guy - the one person worthy of removing THE famous sword from The Sword and the Stone. If he's worthy enough for Merlin, he's worthy enough to teach me some moves! Ooh ooh I have some! How about... Inigo Montoya from Princess Bride? And maybe Drizzt Do' Urden, the dark elf dual scimitars guy. This one is fun! And maybe a lightsaber person- Darth Maul? He was a BAMF with that dual bladed thing. Ok I've never heard of Drizzt Do' but he looks FIERCE and more than capable of wielding a sword!! Nice. One of my friends went with Obi Wan and I felt stupid for not picking a lightsaber person - Darth Maul was pretty epic with his...so was Yoda though when he threw down with Palpatine! Oooh this is a tough one... So far I've come up with a whole 1 person for my possible team. It's becoming clear that most of my favourite characters are not sword-wielders... magic, even small weapons like daggers, absolutely. Not so many sword masters coming to mind! You've got a great team here though. I'd never have thought of Arthur either, genius! LOL! That surprises me Faith^^ LotR? Aragorn? Legolas? Gandalf even? And then Aelin of course...so you have two! Oh and Harry and Neville used the sword of Gryffindor ;D And am I confused or didn't you see Avatar: The Last Airbender? Sooo many questions for you again LOL! Do lightsabers count as swords? Maybe Yoda should be on this list. And I totally agree with your whole list. They are all great choices. Oh man, same here my friend! I love that you said that, most people crush on Legolas (which I do too!) but I've always had a thing for Aragorn ♥ Agreed on Aelin (of course LOL)! Thanks Lola! Yeah a friend of mine had a hard time too hehe! I need to get started on GoT - it's gotten embarrassing LOL! Such a great group! I would love having Aragorn as well!! Yum :D Aelin of course is a natural pick here. I think I would also have to include Link.